Common descent describes how, in evolutionary biology, a group of organisms share a most recent common ancestor. There is "massive" evidence of common descent of all life on Earth from the last universal common ancestor (LUCA). In July 2016, scientists reported identifying a set of 355 genes from the LUCA, by comparing the genomes of the three domains of life, archaea, bacteria, and eukaryotes. 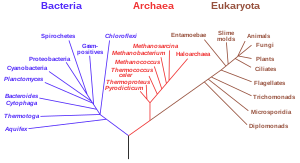 Common ancestry between organisms of different species arises during speciation, in which new species are established from a single ancestral population. Organisms which share a more-recent common ancestor are more closely related. The most recent common ancestor of all currently living organisms is the last universal ancestor, which lived about 3.9 billion years ago. The two earliest evidences for life on Earth are graphite found to be biogenic in 3.7 billion-year-old metasedimentary rocks discovered in western Greenland and microbial mat fossils found in 3.48 billion-year-old sandstone discovered in Western Australia. All currently living organisms on Earth share a common genetic heritage, though the suggestion of substantial horizontal gene transfer during early evolution has led to questions about the monophyly (single ancestry) of life. 6,331 groups of genes common to all living animals have been identified; these may have arisen from a single common ancestor that lived 650 million years ago in the Precambrian. In 1790, the philosopher Immanuel Kant wrote in Kritik der Urteilskraft (Critique of Judgement) that the similarity[a] of animal forms implies a common original type, and thus a common parent. "We do not know all the possible transitional gradations between the simplest and the most perfect organs; it cannot be pretended that we know all the varied means of Distribution during the long lapse of years, or that we know how imperfect the Geological Record is. Grave as these several difficulties are, in my judgment they do not overthrow the theory of descent from a few created forms with subsequent modification". Common descent was widely accepted amongst the scientific community after Darwin's publication. In 1907, Vernon Kellogg commented that "practically no naturalists of position and recognized attainment doubt the theory of descent." No reliable observation has ever been found to contradict the general notion of common descent. It should come as no surprise, then, that the scientific community at large has accepted evolutionary descent as a historical reality since Darwin’s time and considers it among the most reliably established and fundamentally important facts in all of science. 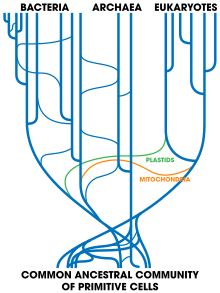 All known forms of life are based on the same fundamental biochemical organization: genetic information encoded in DNA, transcribed into RNA, through the effect of protein- and RNA-enzymes, then translated into proteins by (highly similar) ribosomes, with ATP, NADPH and others as energy sources. Analysis of small sequence differences in widely shared substances such as cytochrome c further supports universal common descent. Some 23 proteins are found in all organisms, serving as enzymes carrying out core functions like DNA replication. The fact that only one such set of enzymes exists is convincing evidence of a single ancestry. 6,331 genes common to all living animals have been identified; these may have arisen from a single common ancestor that lived 650 million years ago in the Precambrian. The genetic code (the "translation table" according to which DNA information is translated into amino acids, and hence proteins) is nearly identical for all known lifeforms, from bacteria and archaea to animals and plants. The universality of this code is generally regarded by biologists as definitive evidence in favor of universal common descent. The way that codons (DNA triplets) are mapped to amino acids seems to be strongly optimised. Richard Egel argues that in particular the hydrophobic (non-polar) side-chains are well organised, suggesting that these enabled the earliest organisms to create peptides with water-repelling regions able to support the essential electron exchange (redox) reactions for energy transfer. Similarities which have no adaptive relevance cannot be explained by convergent evolution, and therefore they provide compelling support for universal common descent. Such evidence has come from two areas: amino acid sequences and DNA sequences. Proteins with the same three-dimensional structure need not have identical amino acid sequences; any irrelevant similarity between the sequences is evidence for common descent. In certain cases, there are several codons (DNA triplets) that code redundantly for the same amino acid. Since many species use the same codon at the same place to specify an amino acid that can be represented by more than one codon, that is evidence for their sharing a recent common ancestor. Had the amino acid sequences come from different ancestors, they would have been coded for by any of the redundant codons, and since the correct amino acids would already have been in place, natural selection would not have driven any change in the codons, however much time was available. Genetic drift could change the codons, but it would be extremely unlikely to make all the redundant codons in a whole sequence match exactly across multiple lineages. Similarly, shared nucleotide sequences, especially where these are apparently neutral such as the positioning of introns and pseudogenes, provide strong evidence of common ancestry. Biologists often[quantify] point to the universality of many aspects of cellular life as supportive evidence to the more compelling evidence listed above. These similarities include the energy carrier adenosine triphosphate (ATP), and the fact that all amino acids found in proteins are left-handed. It is, however, possible that these similarities resulted because of the laws of physics and chemistry - rather than through universal common descent - and therefore resulted in convergent evolution. In contrast, there is evidence for homology of the central subunits of Transmembrane ATPases throughout all living organisms, especially how the rotating elements are bound to the membrane. This supports the assumption of a LUCA as a cellular organism, although primordial membranes may have been semipermeable and evolved later to the membranes of modern bacteria, and on a second path to those of modern archaea also. A phylogenetic tree based on ribosomal RNA genes implies a single origin for all life. Another important piece of evidence is from detailed phylogenetic trees (i.e., "genealogic trees" of species) mapping out the proposed divisions and common ancestors of all living species. In 2010, Douglas L. Theobald published a statistical analysis of available genetic data, mapping them to phylogenetic trees, that gave "strong quantitative support, by a formal test, for the unity of life." 2005 tree of life shows many horizontal gene transfers, implying multiple possible origins. Theobald noted that substantial horizontal gene transfer could have occurred during early evolution. Bacteria today remain capable of gene exchange between distantly-related lineages. This weakens the basic assumption of phylogenetic analysis, that similarity of genomes implies common ancestry, because sufficient gene exchange would allow lineages to share much of their genome whether or not they shared an ancestor (monophyly). This has led to questions about the single ancestry of life. However, biologists consider it very unlikely that completely unrelated proto-organisms could have exchanged genes, as their different coding mechanisms would have resulted only in garble rather than functioning systems. Later, however, many organisms all derived from a single ancestor could readily have shared genes that all worked in the same way, and it appears that they have. If early organisms had been driven by the same environmental conditions to evolve similar biochemistry convergently, they might independently have acquired similar genetic sequences. Theobald's "formal test" was accordingly criticised by Takahiro Yonezawa and colleagues for not including consideration of convergence. They argued that Theobald's test was insufficient to distinguish between the competing hypotheses. Theobald has defended his method against this claim, arguing that his tests distinguish between phylogenetic structure and mere sequence similarity. Therefore, Theobald argued, his results show that "real universally conserved proteins are homologous." ^ a b c d e f g h Theobald, Douglas L. (13 May 2010). "A formal test of the theory of universal common ancestry". Nature. 465 (7295): 219–222. Bibcode:2010Natur.465..219T. doi:10.1038/nature09014. PMID 20463738. ^ a b Steel, Mike; Penny, David (13 May 2010). "Origins of life: Common ancestry put to the test". Nature. 465 (7295): 168–169. Bibcode:2010Natur.465..168S. doi:10.1038/465168a. PMID 20463725. ^ Wade, Nicholas (25 July 2016). "Meet Luca, the Ancestor of All Living Things". The New York Times. Retrieved 25 July 2016. ^ Doolittle, W. Ford (February 2000). "Uprooting the Tree of Life" (PDF). Scientific American. 282 (2): 90–95. Bibcode:2000SciAm.282b..90D. doi:10.1038/scientificamerican0200-90. PMID 10710791. Archived from the original (PDF) on 2006-09-07. Retrieved 2015-11-22. ^ Glansdorff, Nicolas; Ying Xu; Labedan, Bernard (9 July 2008). "The Last Universal Common Ancestor: emergence, constitution and genetic legacy of an elusive forerunner". Biology Direct. 3: 29. doi:10.1186/1745-6150-3-29. PMC 2478661. PMID 18613974. ^ Ohtomo, Yoko; Kakegawa, Takeshi; Ishida, Akizumi; et al. (January 2014). "Evidence for biogenic graphite in early Archaean Isua metasedimentary rocks". Nature Geoscience. 7 (1): 25–28. Bibcode:2014NatGe...7...25O. doi:10.1038/ngeo2025. ^ Borenstein, Seth (13 November 2013). "Oldest fossil found: Meet your microbial mom". Excite. Mindspark Interactive Network. Associated Press. Retrieved 2015-11-22. ^ Noffke, Nora; Christian, Daniel; Wacey, David; Hazen, Robert M. (16 December 2013). "Microbially Induced Sedimentary Structures Recording an Ancient Ecosystem in the ca. 3.48 Billion-Year-Old Dresser Formation, Pilbara, Western Australia". Astrobiology. 13 (12): 1103–1124. Bibcode:2013AsBio..13.1103N. doi:10.1089/ast.2013.1030. PMC 3870916. PMID 24205812. ^ a b Zimmer, Carl (4 May 2018). "The Very First Animal Appeared Amid an Explosion of DNA". The New York Times. Retrieved 4 May 2018. ^ a b Paps, Jordi; Holland, Peter W. H. (30 April 2018). "Reconstruction of the ancestral metazoan genome reveals an increase in genomic novelty". Nature Communications. 9 (1730 (2018)): 1730. Bibcode:2018NatCo...9.1730P. doi:10.1038/s41467-018-04136-5. PMC 5928047. PMID 29712911. Retrieved 4 May 2018. ^ Kant 1987, p. 304: "Despite all the variety among these forms, they seem to have been produced according to a common archetype, and this analogy among them reinforces our suspicion that they are actually akin, produced by a common original mother." ^ Krogh, David. (2005). Biology: A Guide to the Natural World. Pearson/Prentice Hall. p. 323. ISBN 978-0321946768 "Descent with modification was accepted by most scientists not long after publication of Darwin's On the Origin of Species by Means of Natural Selection in 1859. Scientists accepted it because it explained so many facets of the living world." ^ Gregory, T. Ryan (2008). "Evolution as Fact, Theory, and Path". Evolution: Education and Outreach. 1: 46–52. doi:10.1007/s12052-007-0001-z. ^ a b Knight, Robin; Freeland, Stephen J.; Landweber, Laura F. (January 2001). "Rewiring the keyboard: evolvability of the genetic code". Nature Reviews Genetics. 2 (1): 49–58. doi:10.1038/35047500. PMID 11253070. ^ Than, Ker (14 May 2010). "All Species Evolved From Single Cell, Study Finds". National Geographic. Retrieved 22 November 2017. ^ Egel, Richard (March 2012). "Primal Eukaryogenesis: On the Communal Nature of Precellular States, Ancestral to Modern Life". Life. 2 (1): 170–212. doi:10.3390/life2010170. PMC 4187143. PMID 25382122. ^ Sharma, N. S. (2005). Continuity And Evolution Of Animals. Mittal Publications. pp. 32–. ISBN 978-81-8293-018-6. ^ Lane, Nick (2015). The Vital Question: Why Is Life The Way It Is?. Profile Books. ISBN 978-1781250365. ^ Theobald, Douglas L. "Prediction 1.3: Consilience of independent phylogenies". 29+ Evidences for Macroevolution: The Scientific Case for Common Descent. Version 2.89. The TalkOrigins Foundation. Retrieved 2009-11-20. ^ Yonezawa, Takahiro; Hasegawa, Masami (16 December 2010). "Was the universal common ancestry proved?". Nature. 468 (7326): E9. Bibcode:2010Natur.468E...9Y. doi:10.1038/nature09482. PMID 21164432. ^ Theobald, Douglas L. (16 December 2010). "Theobald reply". Nature. 468 (7326): E10. Bibcode:2010Natur.468E..10T. doi:10.1038/nature09483. ^ Theobald, Douglas L. (24 November 2011). "On universal common ancestry, sequence similarity, and phylogenetic structure: The sins of P-values and the virtues of Bayesian evidence". Biology Direct. 6 (1): 60. doi:10.1186/1745-6150-6-60. PMC 3314578. PMID 22114984. Crombie, A. C.; Hoskin, Michael (1970). "The Scientific Movement and the Diffusion of Scientific Ideas, 1688–1751". In Bromley, J. S. (ed.). The Rise of Great Britain and Russia, 1688–1715/25. The New Cambridge Modern History. 6. London: Cambridge University Press. ISBN 978-0-521-07524-4. LCCN 57014935. OCLC 7588392. Darwin, Erasmus (1818) [Originally published 1794]. Zoonomia; or the Laws of Organic Life. 1 (4th American ed.). Philadelphia, PA: Edward Earle. Zoonomia; or The laws of organic life: in three parts (Volume 1) (1818) at the Internet Archive Retrieved 2015-11-23. Harris, C. Leon (1981). Evolution: Genesis and Revelations: With Readings from Empedocles to Wilson. Albany, NY: State University of New York Press. ISBN 978-0-87395-487-7. LCCN 81002555. OCLC 7278190. Kant, Immanuel (1987) [Originally published 1790 in Prussia as Kritik der Urteilskraft]. Critique of Judgment. Translated, with an introduction, by Werner S. Pluhar; foreword by Mary J. Gregor. Indianapolis, IN: Hackett Publishing Company. ISBN 978-0-87220-025-8. LCCN 86014852. OCLC 13796153. Treasure, Geoffrey (1985). The Making of Modern Europe, 1648-1780. New York: Methuen. ISBN 978-0-416-72370-0. LCCN 85000255. OCLC 11623262.